An exceedingly efficient cleaning system that utilizes a low moisture, fast drying foam. This ground-breaking Fast Foamer serves as a transport device and a vessel to hold the cleaning solution. It works in conjunction with a modified counter rotating brush (CRB) machine. The CRB machine is configured to dispense dry foam for a much more effective and time saving process. 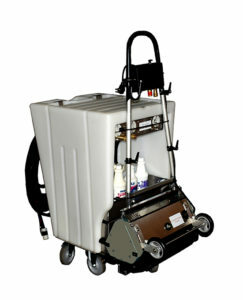 The cart is designed to transport equipment and cleaning solutions needed for the job. Foam cleaning technology is superior to traditional low moisture cleaning methods currently being used. The Fast Foamer can be used on carpet, rubber, natural stone and other hard surfaces. 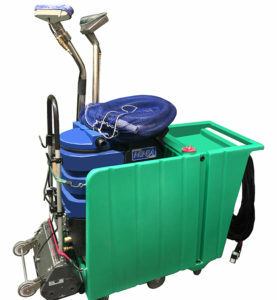 Many features are combined to serve all the needs of the floor cleaning industry. You can expect a more simplified process, a reduction in labor and substantially improved cleaning performance. 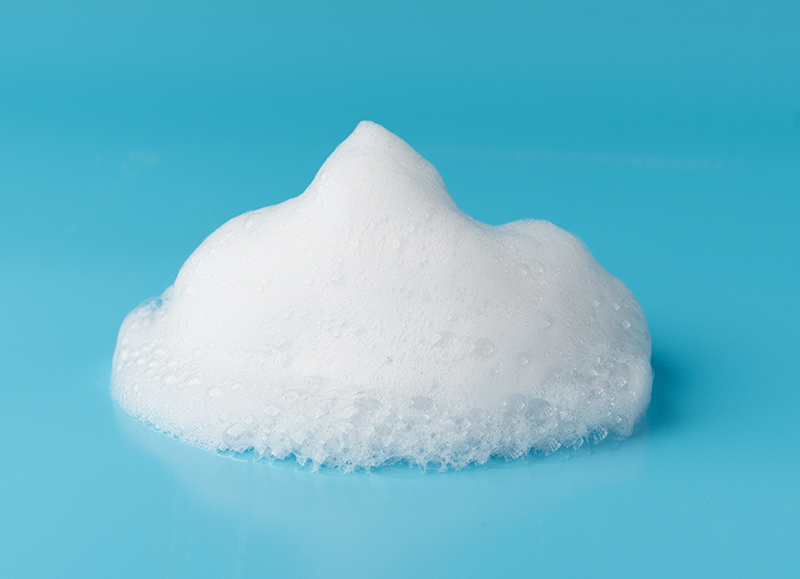 Surfactant is an acronym for surface active agent. Surfactants are the components in detergents that are responsible for the ability to remove soil. Surfactants only work at the interface between a liquid and a gas (air) or any hydrophobic (water-resistant) material such as oil. Foam is superior to a liquid because the gas interface is more than 100x that of a liquid, covering a much greater surface area. Foam exponentially increases the effectiveness of the detergent. This in turn, substantially improves the cleaning performance compared to a liquid type application. Find out more about our equipment today! Fill out this form and we will be in touch with you shortly to provide more information on our superior foaming chemistry.